There’s a few different ways to get the snow experience. You could rent your skis in Sydney (remember when you rented your skis and outfit at Rebel?). Then drive up after work on Friday and stay at the caravan park at Jindabyne and drive up to the snow with all your gear every day (that relationship didn’t last). You could do what our friends the Larry Adlers did and gather some buddies and hire rooms at a lodge so they could hang out after skiing together. 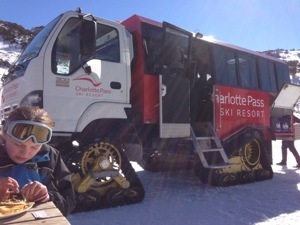 As this was at Charlotte Pass the only catch with this is you have to bring in most of your food. There is a shop at Charlotte’s, but after it has sold you a joke hat and a bag of freckles it has done its dash. 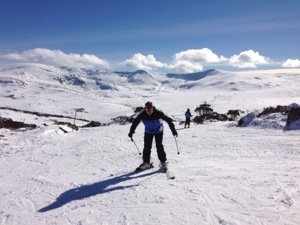 The nearest IGA is about an hour away by oversnow at Perisher. 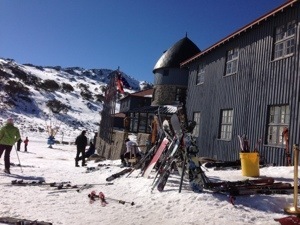 Or you could utterly lash out and stay at the Kosciusko Chalet. Man I love staying here. Especially when remembering staying at the caravan park at Jindabyne. You walk twenty metres up the hill to pick up your gear. You ski out the door of the chalet in the morning after a hearty buffet breakfast to the T bar. And because my husband currently has two jobs, we stayed in the Tower Suite. See that round bit at the top of the chalet? That’s the Tower. The round room is a sitting room with excellent views of the mountain, there’s a double bedroom and a kids bedroom where three kids occupy some pretty squeaky beds. Also a bathroom with a fairly tiny but serviceable bath and one of those hotel showers that make you leap about as the temperature touches all points between ten and eighty degrees at random. It’s gorgeous. I can see the top of the T bar from my bed. We first started staying here when the kids were small, four six and eight. The chalet has a kids club that has actually deteriorated a little in recent times. They used to have a huge room with all the consoles and lots of equipment. They’re now in a quite tiny room with just a Wii, but the staff are still lovely. Anyway, when the kiddies got tired or snow down their fronts you could ski them up to the door, click off your skis, hand in the kid and ski off again all in the space of about five minutes. It was very easy to check on them every hour to see if they’d recovered enough to come back out again. They also take them off your hands at 5.30pm to feed them and you can have them back at 9pm after you’ve enjoyed a three course meal with your dear husband. Awesome. This year the weather was spectacular for the first time in my skiing experience, so we barely used the kids club at all. Sunshine all round, cold enough to keep the snow frozen. So it may be that our time at the Chalet is coming to an end and we should start skiing somewhere that has more than two lifts servicing the mountain. I’ll miss the massive stone, the somewhat leaky windows, the gluhwein, the young cheery slightly inept staff, the relative lack of teenagers (most people bring their own), coaxing my screaming knees up the carved wooden staircase at the end of the day, no queues! Maybe we could go for one more year.